The Federal Register notice extending the comment period on FDA’s preliminary determination that partially hydrogenated oils (PHOs), the primary dietary source of artificial trans fat in processed foods, are not “generally recognized as safe” (GRAS) for use in food is on display and will publish on December 31, 2013. FDA issued a Constituent Update on December 17, 2013 notifying the public that it had made the decision to extend the comment period and that publication of a Federal Register notice was being expedited. The comment period is being extended by 60 days, to March 8, 2014. This extension is being provided in response to numerous stakeholder requests to provide additional time for comments. FDA published a notice in the Federal Register announcing its preliminary determination on November 8, 2013. FDA provided 60 days, until January 7, 2014, for interested persons to provide comments and scientific data pertaining to the notice, including specific issues that FDA sought comments on such as possible alternative approaches, time needed for reformulation, burden on small businesses, and other technical challenges to removal of PHOs from the food supply. Submit comments electronically to the FDA docket on http://www.regulations.gov, use docket number FDA-2013-N-1317. All submissions must include the agency name and docket number. While the FDA 60-day comment period is underway, explore the collection of resources on trans fatty acids, including Official AOCS Methods, books, a listing of analytical references, and more. In addition, learn more about the upcoming AOCS trans Fatty Acid Sample Analysis Webinar. Guarantee your lab is properly identifying peaks with the AOCS trans fat analysis testing sample kit and webinar tutorial. Who should participate: Laboratories who want to verify they are accurately measuring trans fatty acids. When: 18 March 2014 at 10:00 CST. What: This kit includes two samples for testing AOCS Official Method Ce 1h-05. The webinar will help participants identify and avoid commonly made mistakes in order to help their laboratories maintain the highest possible standards of accuracy and reliability. How it works: Purchase this test sample kit and you will be automatically registered for the webinar tutorial. Samples will be shipped to all participants during the week beginning January 13, 2014. Once you receive your kit, analyze the samples using Ce 1h-05 and to remit your labeled chromatograms. AOCS Member Experts and AOCS Technical Services will facilitate the webinar based on the data you supply. As required by the bipartisan Food Safety Modernization Act (FSMA), the U.S. Food and Drug Administration today proposed a rule that would require the largest food businesses in the U.S. and abroad to take steps to prevent facilities from being the target of intentional attempts to contaminate the food supply. The proposed rule is the sixth issued under the landmark FDA Food Safety Modernization Act (FSMA), which focuses on prevention and addresses the safety of foods that are produced domestically or are imported to the United States. Under the proposed rule, a food facility would be required to have a written food defense plan that addresses significant vulnerabilities in its food production process. Facilities then would have to identify and implement strategies to address these vulnerabilities, establish monitoring procedures and corrective actions, verify that the system is working, ensure that personnel assigned to the vulnerable areas receive appropriate training and maintain certain records. The proposed rule does not apply to farms and food for animals. Also in the proposed rule, the FDA describes its current thinking and is seeking comment on other issues, including economically motivated adulteration. The FDA will hold a public meeting on February 20, 2014 in College Park, MD. The FDA will conduct additional outreach during the comment period, which may include additional public meetings. The proposed rule is available for public comment until March 31, 2014. FDA has decided to extend the comment period by 60 days, to March 8, 2014, on its preliminary determination that partially hydrogenated oils (PHOs), the primary dietary source of artificial trans fat in processed foods, are not “generally recognized as safe” (GRAS) for use in food. This extension is being provided in response to numerous stakeholder requests to provide additional time for comments. FDA is expediting publication of a notice in the Federal Register and will issue a Constituent Update when the exact publication date is known. How else can AOCS help you regarding the trans fat debate? We have hourly specials planned for Cyber Monday*! Watch our Facebook, Twitter, and LinkedIn pages on December 2 for twenty-four AOCS specials. We'll be posting a different offer every hour, including Membership specials, Journal specials, AOCS Press book deals, advertising discounts, and more! Mark your calendar, bookmark our pages, and spread the word! Both rules originally appeared in the July 29, 2013 Federal Register. Comments on these two proposed rules as well as comments on the information collection provisions associated with these rules may be submitted until January 27, 2014. For more information on the FSMA and how to comment on proposed rules, visit http://www.fda.gov/fsma. Q&A: The FDA is banning trans fats. We just figured out how to measure them. The Washington Post interviewed AOCS Chief Science Officer and Technical Director Richard Cantrill, Ph.D. regarding the Food and Drug Administration announcement that it intends to ban artificial trans fatty acids from the nation's food supply. Find out more about trans fat from AOCS. New technologies are making it easier than ever to make surfactants from biobased feedstocks. Our first free article from the November-December issue of Inform, the AOCS membership magazine, looks at seven of these novel biobased surfactants. Our second free article discusses color measurement practices. Learn the history of color scales, a critical measurement used to monitor oils at each stage of the refining process, and how selecting and communicating the correct color scale can eliminate confusion and costly misunderstandings. The Supelco-Nicholas Pelick-AOCS Research Award deadline has been extended to December 1. Award includes a $10,000 honorarium. Thomas H. Smouse Memorial Fellowship is now open! The award is for the 2014-2015 academic year and is open to Graduate Students only. Award includes a $10,000 stipend and $5,000 for research funding. Application deadline is February 1, 2014. Visit the Awards Program website for deadlines, nomination requirements, and applications for all of our awards. The Official Methods and Recommended Practices of the AOCS, 6th Edition, 3rd Printing and the 2013 – 2014 Additions and Revisions are now available. Seven new methods have been added, including three for testing 3-MCPD, as well as revisions to 25 previously approved methods. Reminder: the next enrollment deadline for the 2013-14 AOCS Laboratory Proficiency Program is November 20. AOCS Career Services regularly posts some of the best career opportunities in the industry. Take a look below at some current listings, or get more information on the Career Center website. Access the best candidates with AOCS Career Services. Use coupon code 58458480 to receive 25% off all job postings. (expires December 15). AOCS continually strives to provide the most advanced research and education in the fats and oils industries. We invite you to submit your abstract or session proposal for the 105th AOCS Annual Meeting & Expo. As an exhibitor and/or sponsor you have the opportunity to introduce new products, generate sales leads, and strengthen your visibility within the global marketplace. Five leading industry CEOs and other top-level executives will discuss Creating Value in the New Reality. 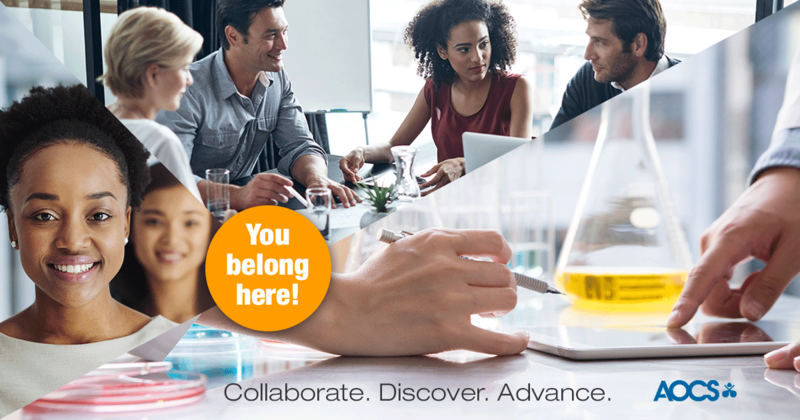 Gain new perspectives from companies such as Henkel, DuPont, Kao, BASF, Lion, P&G, Facebook, Coca-Cola, and more. New in 2014 will be the Technology Showcase, featuring 50 electronic presentations of the latest research from innovative leaders worldwide; and the Industry Innovations Incubator, showcasing start-up companies with cutting-edge ideas and products. POTS 2013 is MPOC's signature event and is jointly organized with the Malaysian Palm Oil Board. The objectives of the seminar are to present and reflect on the current issues that surround the palm oil industry, convey innovative ideas and critical thinking into a single platform, gather oils and fats industry players, marketers, traders, economists, nutritionists, government officials as well as all segments of the private industry to deliberate on the latest developments and way forward for the palm oil industry. OFIC 2014's theme is "Global Oils and Fats: Addressing Major Challenges." Challenges to be addressed include the prospects of oils and fats as commodities, sustainable agriculture, shortage of labor and mechanization, innovation in the palm oil milling, advances in food and non-food applications, new knowledge in human nutrition, and innovative advanced technologies and their applications to the industry. If you would like to receive the AOCS Newsletter and read it in full you may opt-in here. RFP Request "Extraction of High-value Added Ingredients from Microalgae"
NineSigma, representing a major manufacturer, seeks technologies for extracting oil from microalgae and obtaining high purity carotenoids and highly-unsaturated fatty acids from the extracted oil. This invitation is not a complete description of the project. More information is available in the Request for Proposal (RFP) document online at http://www.ninesights.com/docs/DOC-8481. The final submission date for Proposal Briefs is Monday, December 9, 2013. The analysis of antioxidants in edible oils is essential in determining whether an oil is fortified against oxidation (which can lead to rancidity) or if there are other components present in the oil. Researchers at Thermo Scientific in Sunnyvale, California, USA, recently analyzed antioxidants in a household margarine by high-performance liquid chromatography according to the AOAC 983.15 method. 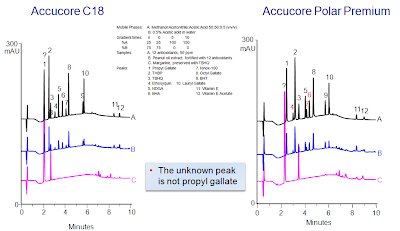 Results obtained using a Thermo ScientificTM Accucore C18TM column revealed a peak that elutes at the same time as propyl gallate, but propyl gallate was not listed as an ingredient. The results were compared against a peanut oil fortified with 12 antioxidants. 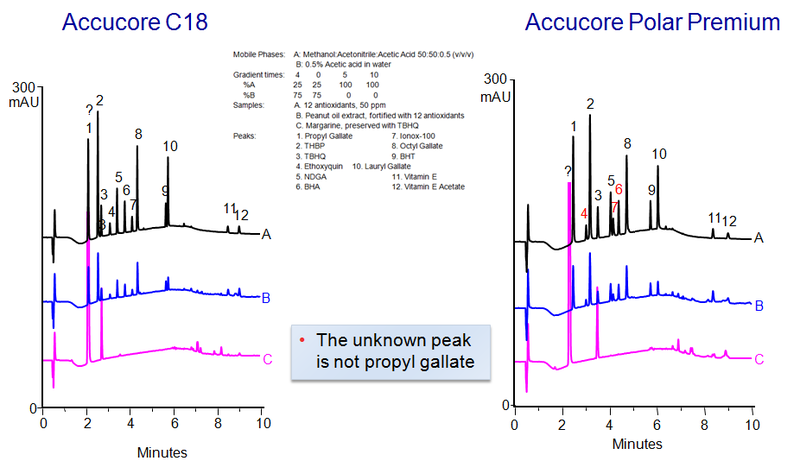 Was the mystery peak propyl gallate, which the manufacturer neglected to list on the label? Or was it the result of a matrix interference effect from another antioxidant or an unidentified constituent? To find out, researchers Mark Tracy, Paul Voelker, and Xiaodong Liu repeated the analysis with a second column type, an Accucore Polar PremiumTM. Results (right figure) show that the margarine mystery peak elutes earlier than propyl gallate and that the tert-butyl hydroquinone (TBHQ) in the margarine overlays with the TBHQ in the peanut oil. The conclusion is the mystery peak is an (as yet) unidentified constituent. This article originally appeared in Inform September 2013, Vol. 24 (8). Inform magazine is an AOCS member benefit providing international news on fats, oils, surfactants, detergents, and related materials. "On Thursday, the Food and Drug Administration announced that it intends to ban artificial trans fatty acids from the nation's food supply because the substances increase the risk of heart disease. According to the Institute of Medicine, "there is no safe level of consumption of artificial trans fat." But how will we be sure that our food doesn't contain any of the stuff whatsoever? We called up the AOCS, which used to be called the American Oil Chemists Society and now just goes by "Your Global Oil and Fats Connection[...]"
"F.D.A. Ruling Would All but Eliminate Trans Fats"
"FDA Rules Trans Fats Unsafe in Food; Determination Could Lead to Ban in Baked Goods, Other Foods"
The U.S. Food and Drug Administration has made a preliminary determination that partially hydrogenated oils (PHOs), the primary dietary source of artificial trans fat in processed foods, are not “generally recognized as safe” (GRAS) for use in food. A final decision would mean that the use of these oils in the food supply would be phased out over a number of years. Removal of PHOs from the food supply could prevent up to 7,000 deaths from heart disease each year. FDA has required industry to declare the amount of trans fat in food on the Nutrition Facts label since 2006. FDA data indicate that many processed foods have been reformulated to reduce the amount of trans fat since the requirement was instituted, but a substantial number of products still contain PHOs. If, after reviewing comments received, FDA determines that PHOs are not GRAS, PHOs could not be used in foods unless authorized by a regulation. One of our core regulatory functions is ensuring that food, including all substances added to food, is safe. 2. How long it would take producers to reformulate food products to eliminate PHOs. The comment and submission period starts November 8, 2013. College students in scientific areas of study have the opportunity for a unique educational experience. The National Biodiesel Board, state soybean boards, and the United Soybean Board, through the soybean checkoff, are offering scholarship opportunities for Next Generation Scientists for Biodiesel members to attend the National Biodiesel Conference & Expo, Jan. 20 – 23, 2014 in San Diego. Even if you are not selected for the full scholarship, the National Biodiesel Board has made available several $100 conference rates for NGSB members. Click here to see more on last year’s student participation! Apply here by Nov. 15, 2013. Students can also present a poster on biodiesel-related research. Submit your abstract here. The poster application deadline is Dec. 1, 2013. House and Senate lawmakers responsible for writing a farm bill will gather publicly on Wednesday for the first time, a meeting expected to shed light on how quickly the conferees could strike a deal on the much-delayed legislation. Follow news on the farm Bill here. AOCS Technical Services is pleased to announce that the 2013 – 2014 Additions and Revisions are now available with seven new methods, including three for testing 3-MCPD, and revisions to 25 previously approved methods. Guarantee that your lab is up-to-date by ordering your copy of these critical updates today. Ensuring your AOCS Methods are current is one of the requirements for ISO 17025 accredited laboratories. Agriculture Secretary Tom Vilsack today announced the availability of $181 million to develop commercial-scale biorefineries or retrofit existing facilities with appropriate technology to develop advanced biofuels. The U.S. Department of Agriculture (USDA) remains focused on carrying out its mission, despite a time of significant budget uncertainty. Today's announcement is one part of the Department's efforts to strengthen the rural economy. "This financing will expand the number of commercial biorefineries in operation in the U.S. that are producing advanced biofuels from non-food sources," Vilsack said. "USDA's Biorefinery Assistance Program is yet another way USDA is helping to carry out the Obama Administration's 'all-of-the-above' energy strategy to develop every possible source of American-made energy. But the benefits go beyond reducing our dependence on foreign oil. These biorefineries are also creating lasting job opportunities in rural America and are boosting the rural economy as well." The Biorefinery Assistance Program was created through the 2008 Farm Bill and is administered by USDA Rural Development. It provides loan guarantees to viable commercial-scale facilities to develop new and emerging technologies for advanced biofuels. Eligible entities include Indian tribes, State or local governments, corporations, farmer co-ops, agricultural producer associations, higher education institutions, rural electric co-ops, public power entities or consortiums of any of the above. Sapphire Energy's "Green Crude Farm" in Columbus, N.M., is an example of how this program is supporting the development of advanced biofuels. In 2011, USDA provided Sapphire Energy a $54.5 million loan guarantee to build a refined alga oil commercial facility. In continuous operation since May 2012, the plant is producing renewable algal oil that can be further refined to replace petroleum-derived diesel and jet fuel. According to the company, more than 600 jobs were created throughout the first phase of construction at the facility, and 30 full-time employees currently operate the plant. The company expects to produce 100 barrels of refined algal oil per day by 2015, and to be at commercial-scale production by 2018. After receiving additional equity from private investors, Sapphire was able to repay the remaining balance on its USDA-backed loan earlier this year. In 2011, USDA issued a $12.8 million loan guarantee to Fremont Community Digester for construction of an anaerobic digester in Fremont, Mich. The digester, which began commercial operations late last year, is the largest commercial-scale anaerobic digester in the United States. It has the capacity to process more than 100,000 tons of food waste annually to produce biogas and electricity. Biogas from the digester runs generators that total 2.85 megawatts in capacity. The electricity produced is sold to a local utility and is providing power for about 1,500 local homes. Applications for biorefinery assistance are due by January 30, 2014. More information about how to apply is available in the October 2, 2013 Federal Register announcement or by contacting the USDA Rural Development National Office. Since the start of the Obama Administration, the USDA Biorefinery Assistance Program has provided approximately $684 million in assistance to support biofuels projects in eight states. Secretary Vilsack noted that today's funding announcements are another reminder of the importance of USDA programs such as the Biorefinery Assistance Program for rural America. A comprehensive new Food, Farm and Jobs Bill would further expand the rural economy, Vilsack added, saying that's just one reason why Congress must get a Food, Farm and Jobs Bill done as soon as possible. President Obama's plan for rural America has brought about historic investment and resulted in stronger rural communities. Under the President's leadership, these investments in housing, community facilities, businesses and infrastructure have empowered rural America to continue leading the way – strengthening America's economy, small towns and rural communities. USDA's investments in rural communities support the rural way of life that stands as the backbone of our American values. President Obama and Agriculture Secretary Vilsack are committed to a smarter use of Federal resources to foster sustainable economic prosperity and ensure the government is a strong partner for businesses, entrepreneurs and working families in rural communities. October, November and December are busy months for AOCS awards. The majority of the awards material close dates fall within these months. This year we are extending the deadline for at least one award. Why? To try to accommodate those of you affected by the partial US government shutdown. We want everyone to have a chance at submitting all required material for full consideration. Therefore, the Stephen S. Chang submission deadline has been extended to November 15, 2013. We are accepting nominations for many of the awards, but deadlines are fast approaching. November 1, 2013 is the next award deadline. Visit the Awards Program website for a full listing of AOCS awards, nomination requirements, and applications. AOCS awards recognize achievements and contributions to the profession, industry and Society. Help honor the work of a deserving colleague. Nominate a colleague or yourself for one of the many AOCS awards. After five years of collaboration amongst manufacturers, consumers and environmentalists, California’s Safer Consumer Products Regulations entered into force on October 1 2013. The impact of the regulations is expected to be felt across the US and beyond. The Regulations take a preventative approach to keeping dangerous chemicals out of everyday products and aim to provide a more predictable process for ensuring product safety. Find out what impact the Regulations will have on your company and what steps you can take now to work towards compliance. Click here to register. Karl Palmer, Chief, Toxics in Product Branch, California's Department of Toxic Substances Control, will introduce the new Regulations. Lynn Bergeson of Bergeson & Campbell PC will focus on the initial steps companies need to take to understand how the regulations may affect their operations in the near future. Emily Tipaldo, Manager, Regulatory and Technical Affairs, American Chemistry Council, will provide practical advice to upstream companies and discuss how they can work with customers in the supply chain to achieve compliance. October 16 at 9am PDT (Los Angeles) / 12pm (New York) / 5pm (London) / 6pm (Brussels). Click here to register. Sign up to the webinar and you will receive a high quality video recording after the event. Submit a question before the webinar to be answered by the speakers. A collaborative study conducted by AOCS over the past 12 months with 20 participants from eight countries has validated three indirect methods for characterizing 3-MCPD- (or monochloropropane-1,2-diol), 2-MCPD- and glycidyl-esters in oils and fats. The body's "silent partners" are the topic of the first free article from Inform, the AOCS membership magazine. Learn how the microbes that live on/in humans affect our physiology, how these microbial communities interact with our environment, and what the implications might be. In our second free article, discover how a shortage of acrylic acid has led to a green route to glycerol and long-chain olefins via ultraviolet irradiation of fats and vegetable oils. "The glycerol can be transformed through catalytic processes into acrylic acid and other essential raw material . . . ," the investigators say. They are not alone in the search for biobased acrylic acid—an extremely versatile industrial chemical feedstock. Allan Green of CSIRO is the recipient of the AOCS Australasian Section Lipid Research Award. He has been at the forefront of research in plant lipid biosynthesis and genetic manipulation for over three decades. Green will receive the award at the AAOCS Biennial Meeting in November. We are still accepting nominations for many of the awards, but deadlines are fast approaching. Visit the Awards Program website for deadlines, nomination requirements, and applications. Don't delay — October 15 is the first nomination deadline. AOCS Business Management Committee members Phil Bollheimer, Doug Lopshire, Ramanathan Narayanan, and Blake Hendrix were joined by Vice President Steve Hill and President Tim Kemper to review the proposed budget for 2014 at AOCS Headquarters in Urbana, Illinois, USA, on October 2. The committee spent the day discussing the proposed budget with AOCS staff. The budget was approved for recommendation to the Board. The next Governing Board meeting will take place in Chicago, Illinois, USA, October 17 in conjunction with the AOCS Value Center Meetings taking place the day before. Members of the Value Centers will meet to assess current activities and to provide input to the AOCS staff about future directions. AOCS Career Services regularly posts some of the best career opportunities in the industry. AOCS members can keep abreast of global regulatory news and meet responsibilities under chemicals legislation worldwide. CW – a news and intelligence service based in Great Britain – will provide several free articles and briefings per month on the AOCS members-only portion of the website. The company is also offering AOCS members 20% off the annual subscription fee for the full news service. Simply log in to your membership account to access the reports. Not yet an AOCS member? Join now! 3-MCPD was the subject of a recent scientific report by the European Food Safety Authority (EFSA). In that report, EFSA notes that the results of its preliminary exposure assessment are uncertain owing to a lack of standard analytical methods. opportunity to discuss our comments in more detail at your earliest convenience." Read "AOCS Response to EFSA Report"(.pdf) in its entirety.